As seniors age Social Security represents an increasing share of total income as the number of beneficiaries receiving support payments grows. Close to a half (45%) of the 8.3 million seniors will depend on Social Security income for sustainment. 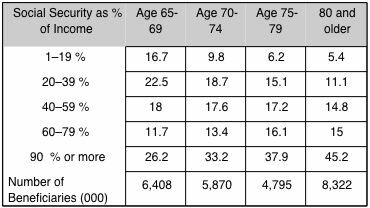 That suggests that a large share of retired seniors will have to retain a very low level of income during retirement.